The Canucks looked to achieve a more consistent game and try to get a better start out of the gate. They also looked to grab a second win out of the three-game road trip. To put it concisely, they batted .500. Sure, it was a win, but most fans will remember this game as a complete sham -- you could put any word after the word "phantom" and the players were getting whistled for it. Phantom goalie interference, phantom charge, phantom hooking, you name it. To what degree was this happening? There were 33 penalties called in the game. There supposedly wasn't a direct correlation, but the NHL live SuperStats counter was down for most of the game and still hasn't been fully tallied for the whole game. Steve McCarthy, Matt Cooke, and Tyler Bouck were injury scratches for Vancouver. Jason Marshall, François Beauchemin, and Corey Perry (member of that crazy London Knights OHL team from last year) were scratches for Anaheim. Already called for two penalties in the first seven minutes, Sami Salo was sent to the box for hooking with 63 seconds left in Ed Jovanovski's holding minor. Dan Cloutier made a number of good stops while on the penalty kill, and Anaheim was held scoreless. There was even strength play for four whole seconds until Bryan Allen was called for a trip. Cloutier made a glove save on a Ruslan Salei one-timer, then got miffed at Rob Niedermayer for camping out in the crease and went right at him, getting in a couple of blows. The Canucks got a break when Rob was issued minors for both goalie interference and roughing. Joffrey Lupul bumped into Cloutier and then got into a scrap with Mattias Ohlund. Like the fate with Rob Niedermayer, Lupul was hit with goalie interference as well as roughing, whereas Ohlund was tagged only with the roughing penalty. Trevor Linden had an open net but put the puck wide on a rebound, though he was checked. Linden had a streak of 11 games without a point coming into this game. 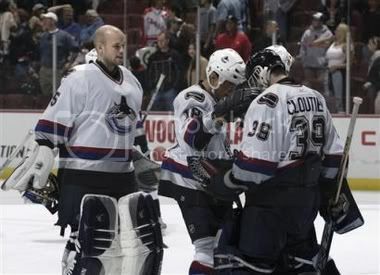 Salo had a slap shot stopped, and Todd Bertuzzi was stopped on a rebound as well. With a first Lupul penalty having not expired yet, Scott Niedermayer went to the box for a cross check. This meant the Canucks were up for a full two minutes' worth of 5-on-3 play since Lupul was to be in the box for 36 seconds after Scott's penalty had expired. Vancouver capitalized just after Scott Niedermayer's penalty expired. Henrik Sedin from the right hashes passed to Salo, who shot straight ahead from the blue line to beat Jean-Sebastien Giguere. Giguere wasn't totally healthy coming into the game, and he was pulled for Ilya Bryzgalov after this goal. One more penalty per side was called for the remainder of the period. Vancouver outshot Anaheim 14-11. Both teams are listed as 0-for-5 on the power play for the period, but since we can only trust the scoresheet so much for this game (and since Lupul was still in the box), and since it was announced in the arena as a power play goal, we'll say the Canucks were 1-for-5 on the power play. The Ducks were definitely 0-for-5 on the power play in the period. Cloutier made a big stop on Travis Moen. Concurrent penalties were issued at the 9:34 mark, with the Canucks getting the bad end of what Anaheim got in the first period. Moen went off for roughing, as did Jarkko Ruutu, but Bryan Allen had gone off for holding as well. With traffic in front, Andy McDonald wristed a puck off the post and into the net from the right hash as Nolan Baumgartner couldn't quite wipe out the screen of Jonathan Hedstrom. There's been some debate as to whether Linden was actually hooked on a shorthanded rush near the end of the period. Linden reiterates that an opposing stick met his glove. Either way, Linden was given a penalty shot that occurred after the final horn of the period. He went in with a forehand and deked to the backhand, putting it past Bryzgalov stick side. Linden's 11-game pointless streak had ended. The Canucks were outshot 10-9 in the period but were ahead 23-22 in shots after 40 minutes. The Canucks were 0-for-3 on the power play while the Ducks cashed in, going 1-for-3. The Canucks were 1-for-8 on the power play after two periods while Anaheim was 1-for-9. Ed Jovanovski had gone off for hooking and an unsportsmanlike conduct in the final minute, and the Canucks had some penalty killing to do to start off the third period. It didn't take long for the Ducks to tie the game. Rob Niedermayer put a puck on the net from the right hash that hit Allen under his arm and trickled through Cloutier's pads and into the net. John Shorthouse and Tom Larscheid on the Canuck radio broadcast couldn't believe the puck got through. Bryzgalov got in a big save on Bertuzzi. Salo snapped a shot from just inside the blue line through a four-man lot of traffic in front (Salei, Scott Niedermayer, Bertuzzi, Brendan Morrison) and through Bryzgalov. With just over two minutes left in the game, Daniel Sedin hit a post on a 3-on-2 rush. The Ducks really didn't help themselves when Vancouver was able to goad Teemu Selanne and Scott Niedermayer into roughing penalties with 24 seconds left. With some scoring punch having gone off for penalties, the Canucks were able to more easily hold the lead regardless of extra attackers and whatnot. Vancouver was 0-for-2 on the power play in the final frame while the Ducks made good on their only power play of the period. Vancouver was 1-for-10 for the game on the man advantage while the Ducks were 2-for-10. Vancouver was outshot 12-6 in the final frame and 33-29 overall. Cloutier stopped 31 of 33 shots. I'm almost glad I was asleep for most of the second period. I took the video from the goal reel at NHL.com to provide more detail for the goals, but I'm glad I didn't have to waste more than one of the five senses watching this game. What were the officials trying to prove? Could you imagine if you took a kid to his first hockey game and he/she had to see this game where the whole game was spent on special teams and whistles were flying left and right? I know there have been some games this year where more penalties have been called than usual, and maye there was a little less flow in the game and everything, but this one had absolutely no flow. Dan Cloutier encountered a knee sprain some time in the game. I think the NHL superstats for faceoffs look passable, so I'll unleash them. The Canucks were 26-for-60 (44%) in the faceoff circle. Brendan Morrison was 7-for-15, Trevor Linden was 2-for-3, Ryan Kesler was 3-for-8, Henrik Sedin was 5-for-16 (ouch), Josh Green was 5-for-6 (good), and Todd Bertuzzi was 2-for-5. Plus-minus isn't too hard to figure out. They've given Trevor Linden a plus-1 mark for the penalty shot (I guess the actual instance was 1-on-1 as opposed to the shorthanded situation when he was hooked), and everyone on the ice for the only even-strength goal of the game was a plus-1, and that included Bryan Allen, Sami Salo, Markus Naslund, Bertuzzi, and Morrison. After taking two of three on the road trip, the Canucks are now 13-6-2, good for 28 points and a two-point Northwest Division lead over the Calgary Flames, over whom the Canucks have a game in hand.